If you’ve got mold from water damage in your home, you probably want to know what to do about it and how to get it removed quickly. Household mold has been associated with all sorts of health problems, some of them quite serious or even life-threatening, including respiratory problems, pneumonia, migraines, asthma attacks, and allergic reactions. Infants, elderly people and those with pre-existinghealth problems are most at risk but anyone can be affected. You can learn more about mold-related health problems here. Of course, if you’re dealing with house water damage, you’ve already got repairs that will need to be made. Mold growth can cause further damage to your home, leading to the need for additional repairs. You can read more about how mold can damage your home. Dealing with the water damage and any resulting mold as soon as possible is the best way to protect both your home and your health. 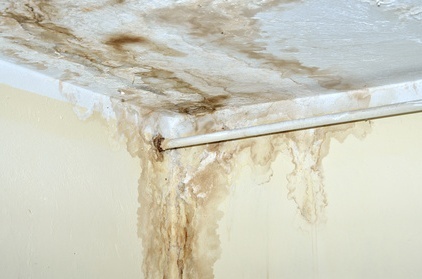 There are several steps to take when dealing with mold related to water damage. Find the cause of the water damage. Sometimes it’s obvious. If there has been a flood at your house, water damage will likely be extensive and you’ll know right where the water is coming from. In other cases, though, you’ll need to do some investigating to figure out why there is water on the kitchen floor or why there are water stains on your ceiling. Stop the water from coming in. If you have a leaky pipe, for instance, you’re going to have to fix it. It does no good to clean up mold and fix the water-damaged floorboards beneath the pipe if water continues to leak out onto the new floor as fast as you can wipe it up. Clean up any excess water. That might be as simple as wiping it up with a towel but if there has been a lot of water, additional measures may be needed. To remove excess water from carpet, you may need to use a shop vac. You may need to bring in fans to help dry out a room. In the event of a flooded basement, you may have to have a professional bring in a pump to remove the water. This can take several days if there is a lot of water in the basement because only two or three feet of water should be removed per day to prevent sudden changes in water pressure causing the walls to crack. Remove moldy materials. This includes furniture, carpet, drywall, and anything else that can be removed from the room. To prevent the spread of mold to other areas of the home while moldy materials are being carried out, everything should be secured in heavy plastic trash bags. Of course, you should wear protective equipment when handling moldy materials and while cleaning up mold, including an N-95 or N-99 face mask. Here is more about protective gear for use when cleaning up mold. Remove any water-damaged materials that will need to be replaced at the same time. For instance, drywall that has been damaged by water will need to be replaced even if there is no mold from water damage present. Clean any remaining moldy surfaces with a fungicide designed to kill mold. Many people use bleach to clean up mold but the National Organization of Remediators and Mold Inspectors (NORMI) recommends against using bleach for that purpose. While bleach may kill mold, it doesn’t always work and it can damage many surfaces. There are also health risks associated with the use of bleach. You can read more about why using bleach to kill mold is not a good idea, and learn about products designed to kill mold. Allow the area to dry completely before making repairs or replacing any items you removed. When repairing water-damaged rooms, consider making improvements to help prevent or at least minimize future damage and mold growth. For instance, put down tile or linoleum flooring instead of carpet in rooms with high humidity or where spills are common, like kitchens, bathrooms and laundry rooms. Consider using mold-resistant paint on walls, as well. If this all seems like a very big job, well, it often is. The average homeowner may not have all the know-how or equipment needed to complete the job. You can call in a professional to help with some of the work or to do the whole job for you, whatever best meets your needs. In some situations, the U.S. Environmental Protection Agency (EPA) recommends hiring a professional, such as when your home has been flooded, when mold covers a large surface area, or when there is mold in your home’s heating, ventilation and air conditioning system. The EPA also recommends consulting your physician before cleaning up mold yourself if you have mold-related health problems or health problems that might be made worse by exposure to mold, like asthma. Check with your doctor if you have any questions about whether it is safe for you to do the work yourself. If you need help with mold removal, you can schedule a free in-home consultation with a mold remediation professional. The EPA advises homeowners to look for mold remediation professionals that adhere to the industry standards established by professional organizations like the American Industrial Hygiene Association (AIHA) and the American Conference of Governmental Industrial Hygienists (ACGIH). To find experienced professionals offering free consultations in your area, just follow the link. And if you need help repairing water damage to your home, including help pumping water out of your basement, you can find qualified contractors here. If you’re worried about cost – because water damage repair and associated mold removal can be expensive – your homeowners insurance policy may cover some or all of the cost. Contact your insurance agent to find out what your policy covers.